Tom Varner, pioneering jazz hornist, composer, and bandleader, has 14 CDs out as a leader/composer–his newest project, “Nine Surprises,” a new work for nonet, came out in 2014. “Heaven and Hell,” an earlier work for tentet, came out in 2009. Tom also plays on over 70 other recordings. 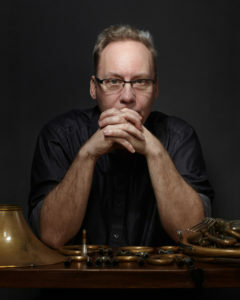 Varner has worked with Steve Lacy, Jim McNeely, John Zorn, McCoy Tyner, Miles Davis with Quincy Jones, Lee Konitz, Bobby Previte, Dave Liebman, The Mingus Orchestra, LaMonte Young, Francois Houle, Reggie Workman, Jim Knapp, and has also appeared with his own ensembles in many jazz festivals around the world. Tom has also performed and presented at many IHS international and regional events, (too many to count!) from 1985 to 2018. A MacDowell Colony Fellow, Varner has also received grants from the Doris Duke Foundation/Chamber Music America, the Jack Straw Foundation, the Blue Mountain Center, and the NEA, and has placed in the Downbeat Critics Poll top ten for many years. Tom studied briefly with Julius Watkins in 1976, and with Jaki Byard (improvisation) and Thomas Newell (horn) at New England Conservatory, and many years later got an M.A. at The City College of New York. He also studied briefly at times with Robert Ward, David Wakefield, and David Jolley. After 26 years in New York, Tom moved to Seattle in 2005 and is very busy in the Pacific Northwest music scene, and is now Associate Professor of Jazz Performance at Cornish College of the Arts.